Khaemwaset at Dapur (year 10); photo by Sesen. Second son of Ramesses II and Queen Isetnofret. Prince Ramesses was an older brother and Prince Merenptah was his younger brother. Princess Bint-Anath was his sister. Khaemwaset had at least three children, their mother's name is not known. Prince Ramesses was his eldest son, and Prince Hori was the son who would later become a High Priest of Ptah, just like his father. Khaemwaset had a daughter named Isetnofret. Below I have attempted to organize the information somewhat according to time-period and geographical period. After this initial period where Khaemwaset may have had some military training, or at least was present, he became a Sem-Priest of Ptah in Memphis. This would have happened in ca. year 16 of Ramesses II's reign. He would have initially been a deputy to the High Priest of Ptah in Memphis named Huy. During his time as Sem-Priest Khaemwaset was quite active. He was involved with the burila of several Apis Bulls at the Serapeum. See Serapeum inscription. After year 30 Khaemwaset becomes involved with the Sed Jubilees. In ca year 25 his older brother Ramesses would have become Crown-Prince, and Khaemwaset becomes involved with the announcements of the Sed Festivals. These sed festivals were traditionally held in Memphis, but we see some of the announcements being made in the south in El-Kab and Silsila. See Sed Festival inscriptions for some of these texts. While a Sem-Priest Khaemwaset may also have become inolved with the construction of / additions to the temple of Ptah in Memphis. There are several inscriptions that attest to Khaemwaset's activities in Memphis. Prince Khaaemwaset is also famous for some of the restaurations to old kingdom monuments. Inscriptions from Khaemwaset can be found at several of the old kingdom pyramids and other monuments. He seems to have undertaken these tasks during his later tenure as Sem-Priest and some of the inscriptions mention his title as 'Chief of the Artificers' of Chief of Crafts'. hence some of these restaurations were undertaken after Khaemwaset had been promoted to High Priest of Ptah in Memphis, ca year 45. Some of the retauration inscriptions can be found below. There are quite few statues and monuments mentioning Prince Khaemwaset and some of these statues etc. are listed below. There are also some records which come from Fayum and Middle Egypt. After ca. year 50 Khaemwaset becomes Crown Prince himslef after the death of his older brother Ramesses. There are several documents from this time period that mention some of the people working for Khaemwaset. We have the name of one of his stewards and treasurers, his retainers, his scribes and even some of the sailors who worked for him. Some of this information is listed under Khaemwaset's subordinates. Finally there are records of some minor items that don't seem to fall under any of these categories, so they ended up under "minor objects"
Sometimes part of the text was omitted and for any further information one should of course consult above mentioned publication. I. Battle of Kadesh from Year 5. The Princes Hor-hir-wenemef, Meryre and Sety are shown leading prisoners. ii. Ramesses, Royal scribe, Generalissimo and [bodily] King's Son [beloved of him] - Maryannu-warriors of the despicable Naharina. iv. Khaemwaset, [Presenting tribute af]ter His Majesty, by the King's Son - Sons of chiefs of the Hatti-land. vi. Nebenkhurru, Presenting tribute after His Majesty, by the King's Son - Maryannu-warriors of Alshe, Ugarit, Nuhasse. viii. Amenemwia, Presenting tribute after His Majesty, by the King's Son - Troops of Masa, (and) warriors of Lukku. x. Sethy, Presenting tribute after His Majesty, by the King's Son - Footsoldiers of Carchemish. xii. Merenptah, Presenting tribute [by the Delegate on the Throne of] Geb, Senior King's Son - Footsoldiers of Ugarit. II. Luxor, Forecourt, W. Wall: N. Side, Bottom register. A. King shoots at Fort (In the land of Qode, in the district of Naharina). i. Four Princes Leading Prisoners: Amen-hir-khepeshef, Ramesses, Pre-hir-wenemef and Khaemwaset. Khaemwaset, Montu-hir-wenemef, Nebenkhurru, Meryamun, Amenemwia, and Setepenre. Meryamun, Amenemwia, Setepenre, and Sety. - Running Princes: Amenhotep, Merenptah. Bodily and Beloved King's Son, Khaemwaset. Beit-el-Wali war scene - close-ups of the two sons. D. Beit el Wali Temple; Nubian War (Co-regency period?). King attacks Nubians and their Village. King accompanied by Prince Amen-hir-wenemef and Prince Khaemwaset. Serapeum; Apis-Burials years 16 and 30. B. Twin Shabti statuettes, from Niche in S. Wall. i. The King's Son and Sem-Priest Khaemwaset - may you behold Re, may he place himself upon your body; the place/throne of Horus is yours there. <text omitted> Monument made by the Sem-Priest and King's Son Khaemwaset. i. Shabti figure, Louvre N 456: Illuminate the Osiris, Sem-Priest and King's Son Khaemwaset. ii. Oval Amulet, Louvre AF 6796: Words spoken. Osiris-Apis, whom Isis (?) has illuminated by her powers (? ), Sem-Priest and King's Son Khaemwaset. i. Prince Ramesses: King's Son and Generalissimo, Ramesses, justified before Sokar. 1st shabti: Illuminate the Osiris Chief directing Crafts and Sem-Priest Huy, justified. 2nd shabti: Illuminate the Osiris Chief directing Crafts, the Sem-Priest Hu<y>. iii. Memphite Mayor Huy: Osiris, Lord ("great") Mayor of Memphis, Huy. vi. Neferhor: Osiris, priest and goldworker of Ptah, Neferhor. vii. Draftsman Khaemwaset: Illuminate the Osiris, the draftsman, Khaemwaset. viii. Lady Sahti-qedet: Osiris, Lady of the House, Sahti-qedet. ix. Lady Huy: Illuminate the Osiris, Lady of the House, Huy, justified. 5 shabtis inscribed for the Osiris Apis. i. 2 shabtis: inscribed for the Osiris Apis. ii. Tyet Amulet, Louvre 2943: Chief directing Crafts, Sem-Priest, King's Son Khaemwaset. iii. Heart(?) Amulet, Louvre AF.2333: .. the fillet, Pillar-of-his-Mother, Sem-Priest, King's Son Khaemwaset. iv. Green Wadj Amulet, Louvre 2318: Chief directing Crafts, Sem-Priest and King's Son Khaemwaset. i. Center Top: Sem-Priest and King's Son Khaemwaset. ii. Center between two seated figures: (Long) live the Sem-Priest and King's Son Khaemwaset. iii. Inner vertical line, right: (Long) live the Sem-Priest and King's Son Khaemwaset., even as the stars in heaven live; May he see Hathor, [Lady] of heaven. iv. Inner vertical line, left: (Long) live the Sem-Priest and King's Son Khaemwaset., even as the stars live in the sky (Nut). <text omitted> the Sem-Priest and King's Son Khaemwaset. i. Over Prince & Offerings: Seated at the offering-table, seeing the sustenance, and the libation-vessel holding (primeval) flood water. i. Upper Register: Prince offers (to Ptah): Khaemwaset. These items were discovered by Mariette and are now in the Louvre. <text omitted> titles: the Osiris, the Sem-Priest and King's Son Khaemwaset. titles: the Sem-Priest and King's Son Khaemwaset. Three rectangular relief fragments from a doorway in the Apis temple at Saqqara. The representations are in sunk relief with inner detail. The inscriptions are carved. Only traces of the scenes are left, but they are mainly offering scenes. The inscriptions mention the title of Prince Kha-em-wese "support of his mother, sem-priest" as well as the name of King Ramesses II. The fragments ÄOS 5081-83 come from the same temple. v. Naos right side: An offering which Sokar, Lord of Ro-Setjau, great god, Lord of the Shetayet shrine, gives; - may he give a happy lifetime following his will, endowed with life, stability and prosperity within Memphis (Inbu, "walls"), - to the Hereditary Prince, Heir Apparent to Geb, the Sem-Priest and King's Son Khaemwaset. vii. Naos base, center line: The living Apis, Herald of Ptah. Year 30, 1st Occasion of the Jubilee-festival of the Lord of Both Lands, Usermaatre Setepenre [given life forever. His majesty decreed that] the jubilee festival should be proclaimed in the entire land, by the King's Son and Sem-Priest Khaemwaset, justified. B. West Silsila Speos, Royal Family Stela by Prince Khaemwaset. Prince, King, Queen and Princess-Queen before Ptah and Nefertem. i. Deities: Ptah-Tonen Nefertem, guardian of the Two Lands, life of the people. iii. Prince: King's Son, beloved of him, Khaemwaset. v. Princess-Queen: Hereditary Princess, great in favor(s) (? ), King's daughter and Great Royal Wife, Bint-Anath, may she live. His elder brother, the Hereditary Prince, Royal Scribe, Generalissimo, and bodily Senior King's Son, Ramesses. His younger brother, the Royal Scribe, skilled of fingers, bodily King's Son, Merenptah. Year 30: 1st celebration of the Jubilee Festival. Year 34: repeat (celebration) of the Jubilee Festival. Year 37: 3rd (celebration) of the Jubilee Festival. - (of) Lord of Both Lands, Usermaatre Setepenre, Lord of Crowns, Ramesses II, given life forever. His Majesty charged the Sem-Priest and King's Son Khaemwaset, to proclaim the Jubilee festival in the entire land. b. Three identical Graffiti: Sem-Priest and King's Son Khaemwaset. ii. King: Lord of Both Lands, Usermaatre Setepenre, Lord of Crowns, Ramesses II, given life. iii. Prince: Sem-Priest and King's Son Khaemwaset. Year 34: Repetition of the Jubilee Festival. The Lord of Both Lands, Usermaatre Setepenre, Lord of Crowns, Ramesses II, given life forever. [His] Majesty decreed that the Sem-Priest and King's Son Khaemwaset, [be charged] to proclaim the Jubilee festival in [the entire land, throughout the South and the Nort]h.
i. Deities: Ptah,Lord of both Lands. Sobek, Lord of Silsila. ii. King: Lord of Both Lands, Usermaatre Setepenre, Lord of Crowns, Ramesses II. The Lord of Both Lands, Usermaatre Setepenre, Lord of Crowns, Ramesses II, given life forever. His Majesty decreed that [the Sem-Priest and King's Son Khaemwaset,] be charged to proclaim the Jubilee festival in the entire land, throughout the South and the North. The servant of the Sem-Priest Khaemwaset, Aya; he came to proclaim the 4th Jubilee, with the scribe of Accounts, Pay, when he came with the Sem-Priest and King's Son Khaemwaset, at the Jubilee festival. ii. 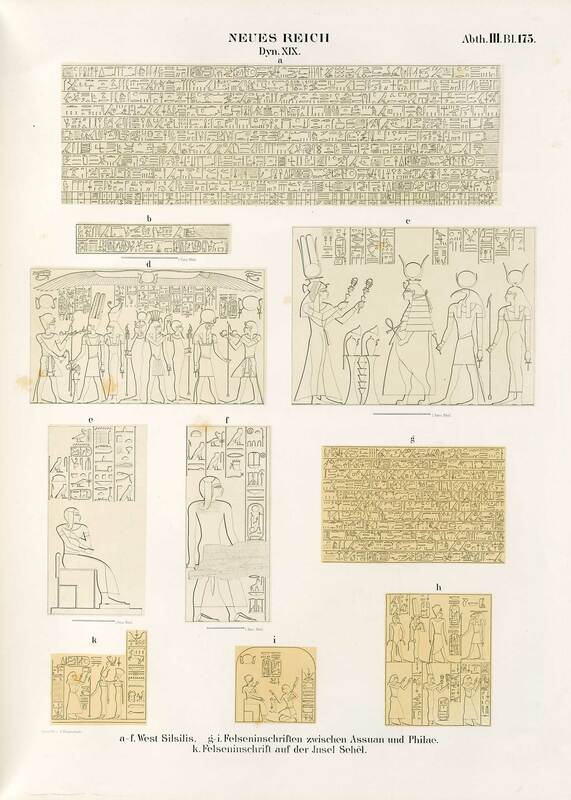 Text, top and left: An offering given to Sobek, Lord of Silsila, and the Royal Spirit of the Lord of Both Lands, Usermaatre Setepenre, namely offerings and all provisions for the Sem-Priest and King's Son Khaemwaset. iii. Base-line: Ramose, The Servant of the Sem-Priest and King's Son Khaemwaset; he came with his master, to proclaim the Jubilee festival. i. Text, top and right: An offering given to Ptah- Tatonen, and the Royal Spirit of the Lord of Crowns, Ramesses II, namely ..., with ...[for ... Khaemwaset], justified. ii. Text, top and left: An offering given to Ptah-Nun the mighty, and the Royal Spirit of the Lord of Both Lands, Usermaatre Setepenre, namely every good thing which Ptah has created; and seeing the King of South and North Egypt in the Per-Wer shrine, [for] the King's Son ... and Sem-Priest Khaemwaset, justified. iii. Base-line: Ramose, The Servant of the King's Son and Sem-Priest Khaemwaset; he came [with his master, to proclaim the Jubilee festival]. El-Kab, Scene in Desert Temple of Amenhotep III. ii. Prince: Bodily's King's Son, beloved of him, Sem-Priest of Ptah Khaemwaset. iii. Text: Year 42, coming by the King's Son and Sem-Priest of Ptah, who pleases the heart of the Lord of the Two Lands, Khaemwaset, to proclaim the 5th Jubilee festival in the entire land. Memphis, Works in Precinct of Ptah. Mentions: [... Chief] directing artisans, the Sem-Priest and King's Son Khaemwaset. Mentions: [...] the Sem-Priest and King's Son Khaemwaset. Mentions: [..] the Sem-Priest and King's Son Khaemwaset. Mentions: Iunmutef-priest and the Sem-Priest , the King's Son Khaemwaset. A. Black granite statue mentioning Khaemwaset's son Ramesses. i. Dorsal Pillar, rear surface: [An offering which the King gives to Pt]ah-Tatonen, father of the gods - namely all life, stability and prosperity, and health, and joy upon earth, along with a goodly burial - for the Iunmutef-priest who purifies the Per-Wer (shrine), Chief Directing artisans, the Sem-Priest and King's Son Khaemwaset. [An offering which the King gives to Sokar]-Osiris, Lord of the Shetayet shrine - namely assuming a place before the Gods, and justification in the great broad-hall, for the Iunmutef-priest who directs the prophets, who knows what is in the temples, the Sem-Priest and King's Son Khaemwaset. ii. Dorsal Pillar, right edge: [It is] his dear [son] who perpetuates his name - The King's Son, excellent in wisdom, upright in mind in every deed, great in his enlightenment at all times to maintain the offerings for his father, - the King's Son Ramesses, justified and venerated one. iii. Dorsal Pillar, left edge: [...] excellent youth, pleasant in love, whom the Lord of Both Lands chose because of his character; pure of hands when he provides offerings for his father daily, the Osiris, Sem-Priest and King's Son, Khaemwaset, and his son, the King's Son, Ramesses. This damaged naophorous statue of a high priest of Memphis was never finished. The front part of the statue, with the knees and part of the legs, has broken off where the naos begins. Also missing are the arms, the right shoulder and the head with the upper part of the back pillar. Traces of the first phase of polishing can be seen on the soles of the feet. The inscription reveals that this statue depicts the priest of Ptah and king's son Kha-em-wese and that it was dedicated by his son Ramesses. Perhaps this statue was erected unfinished, as it is the inscription, which really makes it complete. Scene: Goddess receives Prince or King. Memphis, West Hall of Temple of Ptah. Twice: Lord of Both Lands, Usermaatre Setepenre, Lord of Crowns, Ramesses II, given life forever. Twice: Sem-Priest of Ptah, King's Son, Khaemwaset. ii. Faience Block: Lord of Both Lands, Usermaatre Setepenre, Lord of Crowns, Ramesses II. iii. Black Granite Block: Lord of Both Lands, Usermaatre Setepenre, <Lord of Crowns>, Ramesses II, given life forever. Statue of Ramesses II with Prince Khaemwaset and Princess-Queen Bint-Anath. Prince: King's Son and Sem-Priest, Prophet of the Temple of Ramesses II in the domain of Ptah, Khaemwaset. Inscriptions mention Hathor and Ihy. On the front-left Khaemwaset was mentioned. Around Throne: It is the Chief Directing Artisans (=High Priest of Ptah in Memphis) and Sem-Priest, the King's Son, Khaemwaset , who was glad over this statue of the King's Son Kawab, and who took it from what was cast (away) for debris (? ), in [...] .. of his father, the King of South and North Egypt, Kheops. Then the S[em-Priest and King's Son, Kha]em[waset] decreed that [it be given] a place of favor of the Gods in company with the excellent Blessed Spirits at the Head of the Spirit (Ka) chapel of Ro-Setjau, -so greatly did he love antiquity and the noble folk who were aforetime, along with the excellence (of) all that they had made, so well, and repeatedly ("a million times"). These (things) shall be for (for) all life, stability and prosperity, enduring upon earth, [for the Chief Directing Artisans and Sem-Priest, the King's Son, Kha]emwaset , after he has (re)established all their cult procedures of this temple, which had fallen into oblivion [in the remembrance] of men. He has dug a pool before the noble sanctuary (? ), in work (agreeing) with his wishes, while pure channels existed, for purity, and to bring libations from (?) the reservoir (?) of Khefren, that he may attain (the status of) 'given life'. <text omitted> Khaemwaset has the titles Sem-Priest, the King's Son (B,C) and Chief Directing Artisans in most inscriptions? Scene of Offering Bearer and Priest; Between the figures: The King's Son and Sem-Priest Khaemwaset. Lintel: All life, stability, and prosperity (to/from) the Sem-Priest and King's Son Khaemwaset. [...] Chief of the Secrets in the God's Field [...]; [...] King's Son and Sem-Priest Khaemwaset. i. Down Front: What(ever) comes forth upon the offering table before the Lord of the Sacred Territory, for the King's Son, Khaemwaset justified. Count in Iat-Tjemut, Chief of Secrets in Ro-Setjau the King's Son and Sem-Priest Khaemwaset, justified. i. 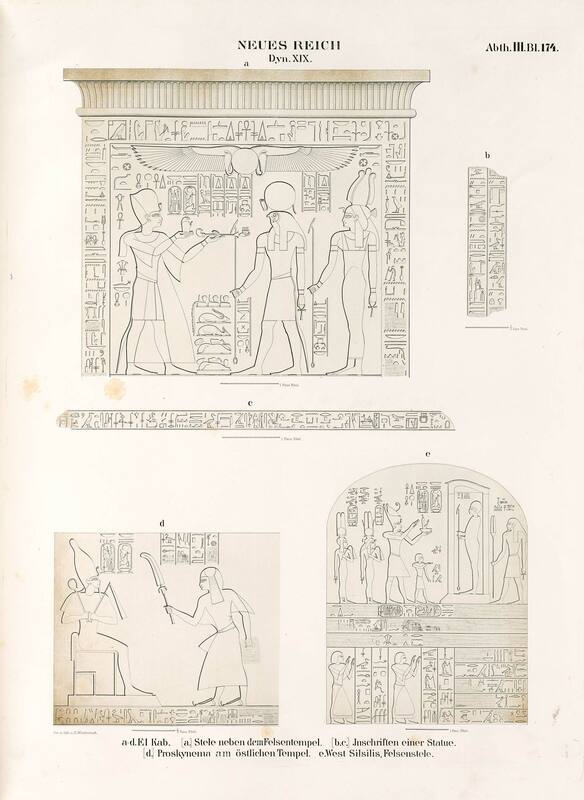 Base, left half: [A hetep di nesu and Sokar, Lord of the Shheta]yet-shrine, namely reposing before the gods, - for the Chief directing artisans, the Sem-Priest and King's Son Khaemwaset. ii. Base, right half: [...]libations, wine, milk and every good thing for the Sem-Priest and King's Son Khaemwaset. i. Base, left half: [...] every good thing for the Chief directing artisans, the Sem-Priest and King's Son Khaemwaset. ii. Base, right half: [...fo]r(?) the Iunmutef-Priest, the Sem-Priest and King's Son Khaemwaset. iii. Dorsal Pillar: [...] forever. This statue fragment portrays Khaemwaset, son of Ramesses II and Isisnefret, who was the high priest of Ptah at Memphis. He is often called the 'first archaeologist', and he restored a number of ancient tombs at Memphis and also constructed the Serapeum. He became especially important in the Graeco-Roman Period, and two demotic stories depict him as a master magician. The Brussels statue shows the prince standing, wearing an archaising wig and a false beard. He holds in his hands an indeterminate cult object. Two identical vertical columns of text on the back pillar tell us that the prince was here shown as the god Horus Iunmutef. The Iunmutef-priest, the Sem-Priest and King's Son Khaemwaset. A "hetep-di-nesu" offering for the King's Son, Sem priest of Ptah, Khaemwaset and the royal scribe, Generalissimo and King's Son Ramesses, mentioning the Osiris Isetnofret. A. Upper Register: King, Isetnofret and Khaemwaset before Khnum. i. Khnum: Khnum, Lord of the Cataract. B. Lower register: Princes Ramesses, Merneptah and Princess Queen Bint-Anath. v. Prince Ramesses: His elder brother, the Hereditary Prince, Royal Scribe, Generalissimo, King's Son, Ramesses. vi. Princess-Queen: His elder sister, King's Daughter and Great Royal Wife, Bint-Anath. vii. Prince Merenptah: His younger brother, the King's Son Merenptah. An offering given by Hathor, Lady of the Southern Sycamore, Chief in the Western Desert, namely reposing in the arms of Nut, as one unique among her children, for the Iunmutef-priest, Counterpart of horus, champion of his father, hier of Osiris, the Sem-Priest and King's Son Khaemwaset. (An offering) given by the living Apis, Atum and Horus together, namely reposing before the gods in the neighborhood of the living Apis, for the Iunmutef-priest in the abodes of Manu, the effective soul, the divine dignitary, the Sem-Priest and King's Son Khaemwaset. i. Prince: Giving praise to Great Green, great god, Father of the Gods, by the Sem-Priest Khaemwaset. ii. Deity: I grant you every good thing that is in me - (so), Great Green. I. Front: Prince and offering table. Behind Prince: [King's Son of] Ramesses II, the Sem-Priest Khaemwaset, justi[fied]. II. Right Side and Rear: [... who fashio]ed(?) him, purifier of the Per-Neser (shrine), the Sem-Priest and King's Son Khaemwaset, justified; may he live. III. Left Side and Rear: [... born of the] beautiful [...] beside Horus, she who adorns the Good god, Lady of Both Lands, Isetnofret, may (she) live. C. Fayum, Medinet Madi, lower half of statue. Milan, Castello Sforzesco. iii. Female figure at left side: his bodily daughter, beloved of him, Isetnofret. D. Sheikh Mubarik, Near Minia, lower part of kneeling statue. i. On Emblem (twice): [...] for the Sem-Priest of Ptah and King's Son Khaemwaset. ii. Dorsal Pillar: [Offering given by?] Hathor (to) Chief directing artisans, the Sem-Priest of Ptah and King's Son Khaemwaset.
" Hail Ihy, son of Hathor, whom the God's Mother has created, The Iunmutef beloved of Ptah, the Pillar of the Good god, radiant sacred image(?) of his father, great luminary (?) of the Temple of Ptah, for whom sacred offerings are provided and libations assigned for Ptah in his monument; (so) the Sem-Priest and King's Son Khaemwaset. On right hand staff: The good god, Lord of Both Lands, Usermaatre Setepenre, the beloved of the Conclave of Gods which is in the Thinite Province. On left hand staff: Son of Re, Lord of Crowns, Ramesses II, [the beloved of] Osiris, Chief of the West. i. Top and front of Naos: Tatonen, mighty name; Tatonen. ii. Naos, right and front: [Gift of] Ptah-Tatonen from Ankh-tawy, to the King's Son of Usermaatre Setepenre, the Sem-Priest Khaemwaset, resting (in) life. iii. Naos, right edge: [...] his father, purifier of the Per-Wer (shrine), Sem-Priest and King's Son Khaemwaset, justified, resting (in) life. iv. Naos, left edge: [...] his father, at the head of the Manu, Sem-Priest and King's Son Khaemwaset. v. Naos, left and front: Gift of Ptah-Tatonen, namely joy and endurance upon earth, for the King's Son of [Ramesses II], [the Sem-Priest Khaemwaset], resting (in) life. vi. Dorsal Pillar: <text omitted>; (for) Chief directing artisans, the Sem-Priest and King's Son Khaemwaset, justified. Text above prince: Sitting at table, making purification with natron and reading out the (funerary) menu, every good offering, for the King's Son of Usermaatre Setepenre, born of the Great Royal Wife, Isetnofret, the Sem-priest Khaemwaset. B. Graffiti, Silsila Quarries: the Sem-Priest and King's Son Khaemwaset. All three read: the Sem-Priest and King's Son Khaemwaset. II. Ramesses-em-Per-Amun, Steward and Treasurer of Khaemwaset: From a Naophorus Statue of Ramesses-em-Per-Amun from Saqqara. The inscription on the statue mentions the King's Son and Sem-Priest Khaemwaset. III. Aty, Sealbearer of the God and God's Father. From canopic jars presented by the Sem-Priest and King's Son Khaemwaset, to Aty. IV. Aya, Servant of the Sem-Priest Khaemwaset. Travelled with Khaemwaset to proclaim the 4th Jubilee (Year 40). From Graffiti in West Silsila. V. Pay, Scribe of Accounts. Travelled with Khaemwaset to proclaim the 4th Jubilee. From Graffiti in West Silsila. VI. Ramose, Servant of the Sem-Priest and King's Son Khaemwaset. Travelled with Khaemwaset to proclaim the 4th (?) Jubilee. From West Silsila Speos, Khaemwaset's South and North Niche. A letter carried by the retainer Meri-Mennufer. Osiris, Lord of Ro-Setjau, Sem-Priest and King's Son Khaemwaset. The Osiris, King's Son and Sem-priest, Khaemwaset, born of the Great Royal Wife Isetnofret. ; The Sem-priest of Ptah and King's Son, Khaemwaset, born of the Great Royal Wife Isetnofret. King's Son and Sem-Priest Khaemwaset, justified in peace.